Doublefile viburnum is a beautiful shrub. With green leaves as the backdrop for the creamy flower clusters that look like they float above the branches, this viburnum is a showstopper in the landscape. A double row of these clusters blossoms on each branch in the spring and lasts for about a month. The white highlights the horizontal growth pattern of the branches, almost like they were coated in snow. Once the flowers fade, they are replaced with clusters of small berries favored by many birds. In the fall, the leaves turn a deep purple before they drop to the ground. 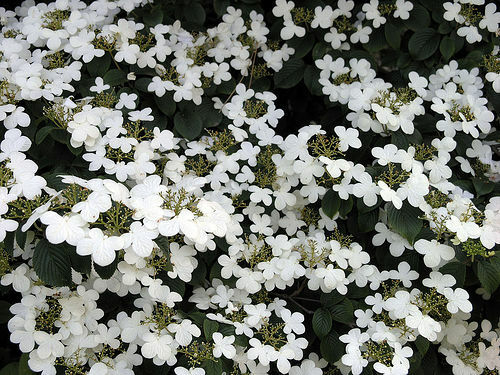 This shrub grows quite large, so give it ample growing space for the most stunning effect. Native to China and Japan, this viburnum shrub is a popular choice for many gardeners. Doublefile viburnum is used in mass plantings for a spectacular effect. It is also a good plant for a border of shrubs or as a screen. It also makes a lovely specimen plant due to its colorful display. It looks especially nice in a woodland garden. Plant with evergreen shrubs, other viburnums and other woodland plants. There are many different cultivars available to suit many different gardening needs. Some are more compact than others when you have limited space. Most cultivars are not suitable for foundation plantings due to their size potential. Doublefile viburnum should be planted in moist, well-drained soil for the best growth. Water it regularly, especially the first year. It likes full sun but will tolerate partial shade. Shade will affect the growth rate. Annual pruning should take place after the blooms fade. You want to remove any branches that cross or crowd others. Another pruning tip for this plant is to remove one to three of the oldest stems all the way to the ground to encourage new growth from the bottom and prevent the shrub from becoming top heavy. Doublefile viburnum has few pest problems and is easy to grow and maintain. They do not like to dry out.